In the early days, business recommendations were based on word of mouth. Today, they still are – across billions of connected consumers, both B2B and B2C. The speed and that everyone has an audience has changed how people interact with your company. Their behaviors, attitudes and opinions shape the perceptions and buying habits of tens of thousands or even millions of people – perhaps without you even noticing. I hear voices and make them actionable. I am responsible for social listening, analytics, tools and technologies and some educational parts of the Pitney Bowes social media program. People are in search of valuable and authentic content that is relevant to them. Sometimes it is to help them make a better buying decision; perhaps help their family in some way or simply to learn. Mobile devices, tablets and internet-based communities fueled by the content explosion make this easier for them to access. These are where my own thoughts live and play. Nobody else’s, unless you want to comment. I have led content, social media or analytics programs for numerous companies including Intel, Jabra and, as a volunteer, Destination Imagination. I am a recovering journalist. I am content first – always. I am amazed at the many different ways people interact and share content. My vision is several years down the road, but I act in the present – which helps me prepare to take advantage of emerging technological and cultural / behavioral changes. 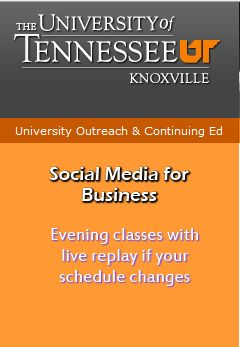 I teach the Future of Business and social media classes for the University of Tennessee. Strong experience in B2B (Business-to-Business) , B2C (Business-to-Consumer) and B2G (Business-to-Government) settings, as well as C2B and P2P (peer-to-peer). This blog is where my own ideas and thoughts get to run free and are not those of any company that I do or have worked with, worked for or volunteered with. (I think I got everything).